-Great chance to add sparkle to your everyday style and get compliments from everyone who sees it. -Modern design and finely crafted details make this key ring outstanding and eye catching. -Perfect for handbag/phone/keychain/car pendant accessory and easy to off or wear. 1) No purchase worries anymore. If you have any questions when receive it, please feel free to contact us. 2).We offer great customer service. If you have any question, please leave us a message. We will give you a response as soon as we can. 1). With the difference in measurement method, please allow 0.1-1 inches in size and weight deviation. 2). Due to differences between monitor displays, actual color may vary slightly from image. Package included: 1 x Cute Keychain with a gift packing bag. A unique and charm accessory that organizes your keys or clip it to your bag, purse, backpack or car ornament. Material: Glitter rhinestone + high quality alloy. Great chance to add sparkle to your everyday style and get compliments from everyone who sees it ! 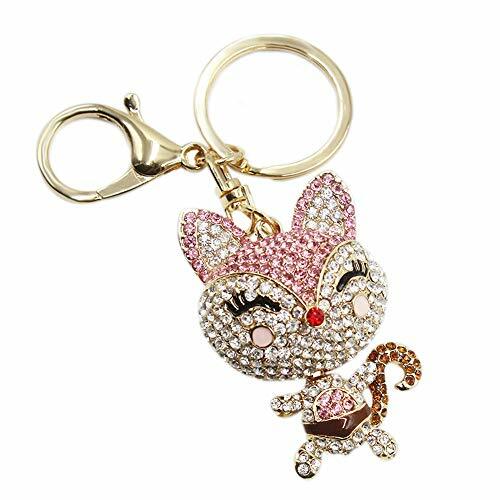 Charm Pendant: Gold-plated keychain with sparkly crystal rhinestone and in well-designed fox shape. Make your keys more conspicuous, attractive and draw happy attention. Great Gift: A perfect present for Birthday, Valentine's Day, Mother's Day, Thanksgiving, Christmas, Graduation and any Occasion. We will provide you with a nice gift bag, suit for sending to your friends, family, colleagues, also great for yourself. If you have any questions about this product by leomoste, contact us by completing and submitting the form below. If you are looking for a specif part number, please include it with your message.